One significant feature that links Jupiter, Saturn, Uranus and Neptune is the presence of ring system. Now a fifth solar system body can be added to this rarefied group, and it is a rather surprising addition. Observations at several sites in South America including ESO’s La Silla Observatory have discovered that the remote asteroid Chariklo is surrounded by two dense and narrow rings making it by far the smallest known object to possess a ring system. The origin of the rings remains a mystery, but it is believed they may have resulted from a collision that created a disc of debris. 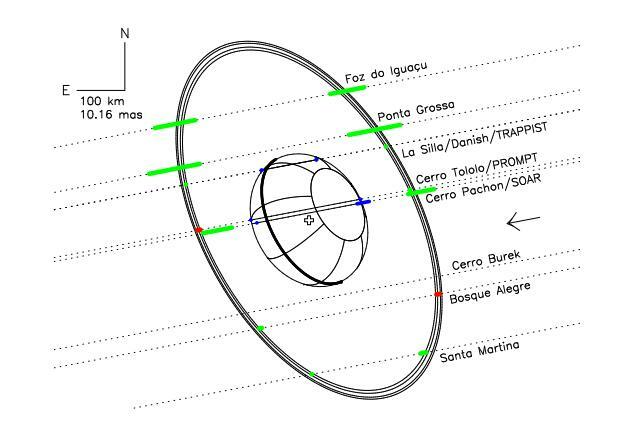 These results were published in a paper in the online journal Nature on 26 March 2014 titled “A ring system detected around the Centaur (10199) Chariklo”, by F. Braga-Ribas et al. As anyone who has ever looked through a telescope knows, the rings of Saturn are perhaps the most spectacular sight in the heavens, and while less prominent rings have been found around the all the gas giants, many detailed searches have failed to reveal any other ring systems around smaller bodies, until now. A team of astronomers utilised the powerful occultation technique where an intervening celestial body passes in front of a star, temporality “blinking out” the background star to make the surprising discovery. As minor planet (10199) Chariklo passed in front of star, the recorded light curve showed the presence of two fine rings. Chariklo is the largest member of a class known as the Centaurs and it orbits between Saturn and Uranus. Chariklo was predicted to pass in front of the star UCAC4 248-108672 on 3rd June 2013, as seen from South America. 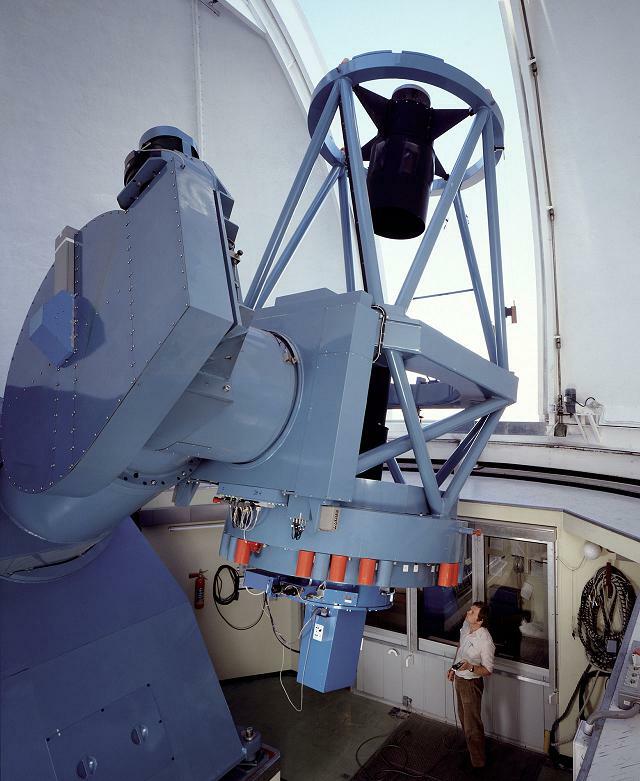 Astronomers used eight telescopes at seven different locations and were able to observe the star vanish for a few seconds as it was blocked by Chariklo. 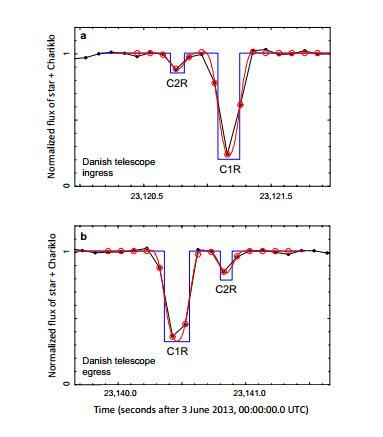 Light curve of Chariklo’s transit as seen by the Danish 1.54m telescope. The central dip is due to Chariklo transiting in front of the background star. The two dips to the left and right are due to two rings also transiting. Credit: F. Braga-Ribas et al. However, much to their surprise, a few seconds before and after the main occultation, there were two short dips in the stars apparent brightness. The power of observing from multiple sites is that by comparing recorded observations, one is able to build a silhouette of the blocking object with a resolution that far exceeds anything that can be achieved using the normal resolving power of a telescope. The team were able to reconstruct not only the size and shape of Chariklo itself, but also the shape, width and orientation of the newly discovered rings. Detailed view of the ring occultation events with best fits. Credit: F. Braga-Ribas et al. The data taken with the Danish 1.54m telescope (La Silla) is shown in the accompanying light curve. The data rate was almost 10hz in a long-pass filter and cut-off below 650nm. 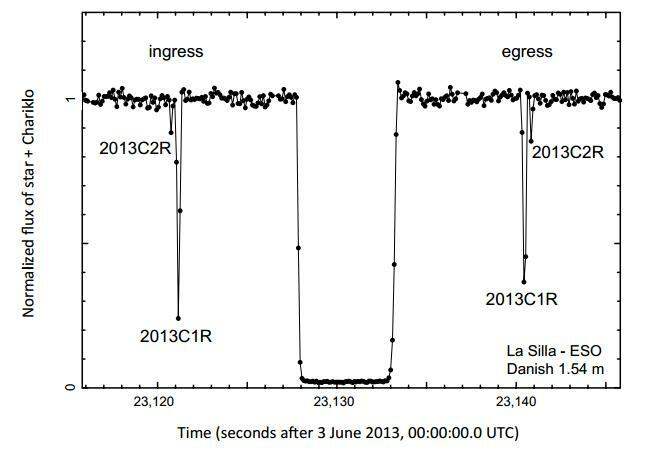 The central drop of the star flux is caused by Chariklo and the two secondary events 2013C1R and 2013C2R are observed at ingress (before the main occultation) and egress (after). Their findings were that the 250km diameter Chariklo has two sharply confined rings only seven and three kilometres wide, separated by a clear gap of 9km. 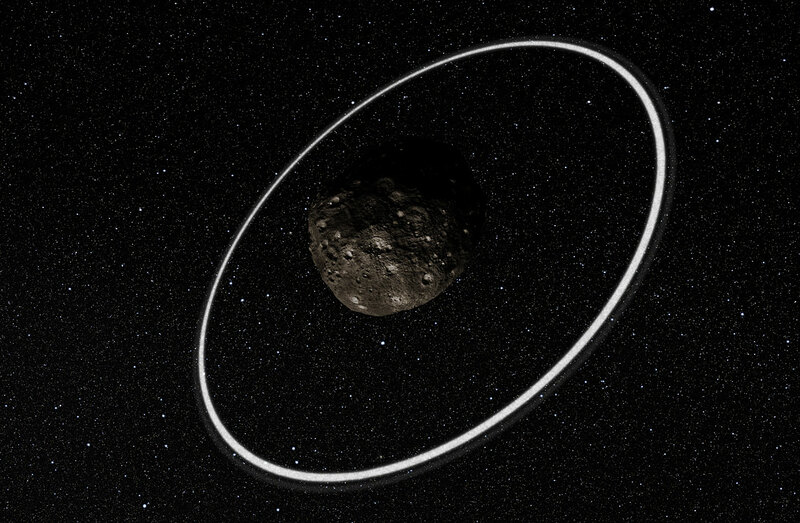 The rings we know of in the solar system are confined by shepherding moons, and it may well be in this case that the rings are also confined by the presence of small putative satellites, implying that Chariklo has at least one small moon to still be discovered. arrow indicating the direction of motion. Credit: F. Braga-Ribas et al. The team leaders have provisionally called the rings by the nicknames Oiapoque and Chui, two rivers bear the northern and southern extremes of Brazil. Tagged (10199) Chariklo, asteroid ring system, Chariklo, occultation.